Or sign up 24/7 online. To schedule a presentation about Helpline services to health professionals or inquire about the status of a print order, please contact the Communications Department at (858) 300-1010. For media inquiries regarding the California Smokers' Helpline, please contact the Communications Department at (858) 300-1010. For media inquiries regarding any of the programs below, please contact the person listed for each program. 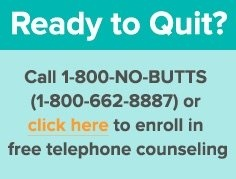 The Asian Smokers’ Quitline is a free nationwide Asian-language quit smoking service operated by the Moores Cancer Center at the University of California, San Diego. For more information or to order free promotional materials, please contact ASQ at (858) 300-1015 or asq@ucsd.edu. With support from First 5 California and the American Academy of Pediatrics, CEASE California trains pediatric providers to help the parents/caregivers of their patients quit smoking. For more information or to schedule a training for your pediatric or family practice, please contact Jyothi Marbin, M.D., at (510) 428-3885 x4408 or aapcease@gmail.com.. The Center for Tobacco Cessation (CTC) is the training and technical assistance arm of the California Smokers’ Helpline and helps organizations throughout California to increase their capacity in tobacco cessation.To request a customized training, technical assistance or additional information for your practice or organization, please contact Lesley Copeland at (858) 300-1051 or lcopeland@ucsd.edu.